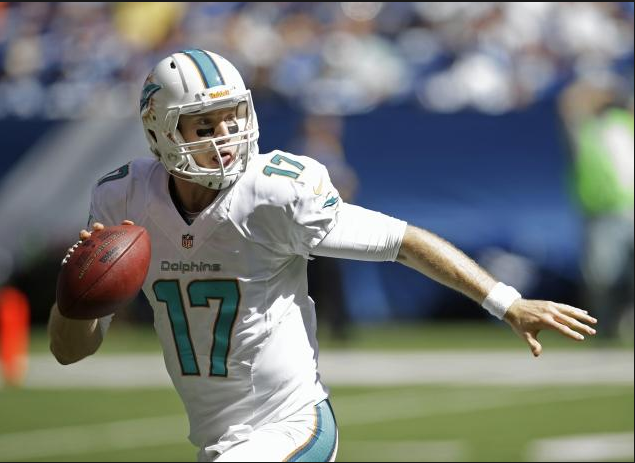 Ryan Tannehill and the Dolphins could be playing on Super Sunday next year... No, seriously. Ok, maybe not that seriously. We've made it to that comfortable void between the conference championship games and the Super Bowl, and two fan bases are in football fandom heaven right now. Yep, those lucky bastards in Denver and Seattle get to dream about their team's Super Bowl date in just under two weeks, not to mention all the reminiscing they're already doing about the 2013 season and accompanying postseason. You see, making the Super Bowl is such a huge accomplishment, that the season is already a success for both this teams. After all, Peyton Manning did beat Tom Brady to get here, and the Seahawks got to defeat, then totally belittle, the hated 49ers to make Super Sunday. Only a New England Patriots fan could complain about just making the Super Bowl. For fans of the other 30 teams, however, there are few good vibes. Even if your team overcame youth and a mountain of injuries to make championship Sunday (talking to you again, Patriots fans), the sting of that loss is still too fresh to really appreciate what they accomplished. At this time of year we often forget what a bright future each of our teams truly has. So SuiteSports is here to remind you of that, and brighten up your day by telling you why your team is THIS CLOSE to making the big game next year. We begin today with the AFC and move onto the NFC tomorrow. The AFC East by Jeremy Conlin, disgruntled Patriots fan. All things considered, this was the best a Patriots fan could have hoped for - the list of players they lost to free agency, injury, and the criminal justice system is rather staggering, and yet they were one of the last four teams playing. Bill Belichick proved once again that he's the best coach in the NFL, constantly re-adjusting what the team does on the fly, knowing that his players are prepared well enough to pull it off. Going forward, the Patriots have planted the necessary seeds for returning to borderline-juggernaut status, especially on defense. Linebacker Jamie Collins and cornerback Logan Ryan showed flashes of star potential towards the end of the season, and the Patriots project to have a deep and diverse group of linebackers and edge pass rushers next season, which should only be improved by the return of Vince Wilfork in the middle of the defense. With the defense healthy, the Patriots spend the off-season re-signing Aqib Talib, spending another top pick on a defensive back to round out the secondary, and targeting receivers and tight ends in free agency, such as Eric Decker, Hakeem Nicks, Golden Tate, Jeremy Maclin, Emmanuel Sanders, James Jones, their own Julian Edelman, Dennis Pitta, Brandon Pettigrew, and/or Fred Davis (all unrestricted free agents). If they can work their cap magic to nab one of those players, they should see their pass offense make a leap back towards 2010-2011 levels. With an improved defense, 12 wins might be on the low end of the spectrum. The Jets did much better than most people expected, riding a strong defense and a high-variance offense to a surprise 8-8 season despite sporting the average scoring margin of a 5-11 team. They were abnormally lucky in close games, going 5-1 in games decided by a touchdown or less, with the only loss coming in overtime to the Patriots in torrential downpours in Week 2. Geno Smith didn't have a great rookie season (or even a good one), but he showed that he has a strong arm and can cause problems for defenses when he gets outside the pocket (granted, the same could have been, and was said about Mark Sanchez after his rookie season). Chris Ivory and Bilal Powell both had decent years running the ball, and Smith should be more comfortable next year with another full off-season under his belt. An improved Smith allows New York to open up the passing game, and the defense continues to improve around stars Muhammad Wilkerson and Antonio Cromartie, along with improving youngsters Dee Milner, Sheldon Richardson, and Quinton Coples. The defense returns to top-five status, and like Mark Sanchez's first two seasons, the Jets make a surprise trip to the AFC Championship game. This time they come out on top. There are things to be excited about in Miami, most of them to do with quarterback Ryan Tannehill, who had a very strong year despite being overshadowed by some other quarterbacks from his class, with names like Luck, Wilson, and Foles. The Dolphins offense was submarined by its offensive line, one of the worst units in the league. If they spend their free agent dollars and top draft picks shoring up their bulldozers up front, they have the talent at the skill positions (and a potentially looming Matt Ryan-type jump from Tannehill) to come back next year with a top-10 offense. If they can couple that with an improving defense, with Cameron Wake returning to 100%, and last year's top pick Dion Jordan shedding bust whispers (just two sacks his rookie season? ), the Dolphins could match a great pass rush with three underrated corners in Brent Grimes, Dimitri Patterson, and Nolan Carroll. Several teams in previous years have shown you can build an elite defense solely on a great pass rush and an opportunistic secondary, so if the chips fall right for Miami, they could ride a Wild Card berth all the way to Glendale in February 2015. The team to watch for to make a big leap is usually a team that (a) finished 3rd or 4th in their division the previous year, (b) suffered a number of key injuries or "down" years from star players, and (c) identifies one weakness and markedly improves it the following year. For instance, look at the Chiefs. They went from 2-14 to 11-5 on the strength of an easy schedule, a healthy defense, and improved performance from their new quarterback and head coach. The Eagles went from last in the NFC East to first. The Saints did the same in the NFC South. The Redskins, Vikings, and Colts made leaps from last place to the playoffs from 2011 to 2012. Next year's Team Turnaround very well could come from Buffalo. They play the AFC West (easy win against Oakland and with assumed improvement, a home game against San Diego is very winnable) and NFC North (the entire division is in flux outside of Green Bay), and their "extra" games are Houston and Cleveland. The offense should take steps forward, with a full healthy season from E.J. Manuel and a bounce-back year from C.J. Spiller (who actually finished the season strong after a disappointing start). The defense should continue improve around established stars Mario Williams and Marcel Dareus, and budding stars in Jerry Hughes and Kiko Alonso. After putting together the 4th-best pass defense last year in yards allowed, all they need is to improve their run defense for a top-10 outfit overall. Combine that with the big-play potential of their offense, the 2014 Bills mirror the the 2003 Panthers, 2000 Patriots, and 1999 Rams and go from last place to a Super Bowl appearance. The AFC North by Joe Parello, Steel believing Pittsburgh fan. The Bengals finished third in the league in total defense in 2013, and that was without All-World defensive lineman Geno Atkins in the lineup after his ACL tear on Halloween. Losing defensive coordinator Mike Zimmer barely hurts, as Cincinnati becomes the league's best defense, with the return of Atkins in the middle of the front, and the continued development of end Carlos Dunlap. On offense, Andy Dalton finds consistency in his fourth season in the league, taking that quantum quarterback leap to "very good" status. The improved play of Dalton makes A.J. Green the league's leading receiver, and now-second year back Giovanni Bernard has a 2002 Charlie Garner-esque year running and catching the ball, while the Law Firm excels in his role as a short yardage back. The Bengals sweep the rest of the AFC North on their way to a 13-3 record and home field advantage throughout. This time around, Cincinnati sells out Paul Brown Stadium the first day tickets go on sale, and Dalton throws for 750 yards and six touchdowns, with no interception in two home playoff wins against Brady and Manning. "But, is Dalton elite now?" is the talk on ESPN as the Bengals return to the Super Bowl after a 26-year absence. Need I remind you that the Steelers finished the year 6-2, and were two atrocious calls in the Chargers-Chiefs game away from making the playoffs this year? Need I also remind you that they were a two-point conversion against Baltimore and one foot inbounds against Miami away from finishing the year on an eight-game winning streak? The Steelers carry their tremendous offensive momentum from the end of 2013 into 2014, as quarterback Ben Roethlisberger puts together an MVP-type season, throwing for over 4,500 yards and 35 touchdowns, with single-digit interceptions. More than a few of those touchdowns go to All Pro receiver Antonio Brown, but the now-healthy Heath Miller puts together a solid season, and old man Jericho Cotcherty proves to again be reliable. The emergence of second-year wideout Markus Wheaton in the slot stresses opposing defenses to their breaking points. But this offense isn't a one-trick pony, as Le'Veon Bell becomes Pittsburgh's first 1,000 yard rusher since the Super Bowl season of 2010, making the Steelers one of the league's most balanced attacks. The disappointing defense of 2013 (which was still top half in the league) is boosted by the return of Larry Foote at inside linebacker, and the continued improved play of Jarvis Jones and Jason Worilds on the outside. Ike Taylor makes a surprise switch from corner to free safety, teaming with Polamalu to form one of the league's best duos after Ryan Clark re-signs as a reserve. The Steelers split the season series with the Ravens, because, of course they do, but win the division at 12-4, clinching the No.2 seed in the AFC. After knocking off Brady and the Pats in Pittsburgh, the Steelers are gifted another home game when Wild Card Cincinnati shocks Denver. The Steelers beat the Bengals for the third time and head back to the Super Bowl. Joe Flacco went from demigod to scapegoat in 2013, but a return to glory is in order next season. The Ravens struggle out of the gate, and the "what the hell happened to Ray Rice?" talk continues. Finally, Baltimore decides their diminutive running back doesn't have the stuff to go every down any more, opting to ride Bernard Pierce, who proves up for the challenge. Rice begrudgingly accepts his role as the team's third down back, helping out as a pass protector and receiver. On defense, Elvis Dumervil and Terrell Suggs each have career years, giving Baltimore the most feared pass rush in football. The D keeps Baltimore afloat until Flacco catches fire in week 12. With Flacco dropping dimes, the Ravens roll off six straight wins to finish 11-5 and capture the No.3 seed in the AFC. A Wild Card win over division rival Pittsburgh sends the Ravens to New England, where Flacco lights up the Patriot defense for 400 yards and five touchdowns. Another huge playoff game in Denver leads to another Flacco last minute bomb and Baltimore win. The "he just wins" and "he plays best when it matters" talk heats up, and Flacco's elite status is debated in sports bars across America as the Ravens return to the Super Bowl. The Browns head into the 2014 NFL Draft with a Top-10 defense and one of the game's best wideouts, but a huge question mark at quarterback. Browns haters laugh as the team selects troubled Texas A&M quarterback and former Heisman Trophy winner Johnny Manziel early in the first round. Turns out, the joke is on them. Manziel turns into a hybrid of rookie Russell Wilson and rookie Ben Roethlisberger, constantly making plays outside the pocket with both his legs and his arm. He starts from day one, and despite starting 0-2, the Browns know they have something. By midseason, Manziel leads the league in rushing yards by a quarterback, and has developed a connection with All World wideout Josh Gordon. Gordon finds holes in opposing secondaries as Manziel buys time with his feet, and breaks Calvin Johnson's single season receiving yardage record, becoming the first receiver to amass over 2,000 yards in a single year. The Browns still finish second in the North to the Begnals, but upset their in-state rivals on Wild Card weekend behind 5 total touchdowns from Manziel. Cleveland avenges "The Drive" with a come-from-behind win in Denver the next week. Announcers proclaim "shades of Elway!" as Manziel orchestrates a 99-yard touchdown drive in the game's final 1:21 to lead Cleveland to a 45-42 victory. The AFC championship isn't nearly as close, as the Cleveland defense chokes the life out of New England, with All Pro Joe Haden picking off Tom Brady twice, sending Cleveland to its first Super Bowl ever. Manziel's pre-Super Bowl partying pictures break the internet. The AFC South, also by Joe Parello. Fans in Indianapolis get to root for their old boy Peyton in this year's big game, but they'll be rooting for their hometown team in 2014. Andrew Luck continues his run as the king of the comeback in the current NFL, leading five fourth-quarter comebacks as the Colts finish 13-3, beating their "expected win" total of 9.7, and causing stat nerds to scream "beware of regression" as the playoffs begin. But nothing changes for the AFC's top seed. The Colts host Brady and the Pats in the Divisional Round, and exact revenge for their 2013 defeat when Luck throws a last minute touchdown pass to bury New England. In the conference championship, Luck has to dethrone the man he replaced in the house that he built. Peyton Manning's playoff reception in Indianapolis isn't quite as nice as his first trip back to play his old team, as Robert Mathis and the Colts defense sack him seven times, forcing the five-time MVP into three interceptions. Still, early mistakes by Luck and an inability to stop Denver's ground game allow the Broncos to carry a 20-14 lead into the final two minutes. With just one timeout in his back pocket, Luck leads the Colts 80-yards in seven plays for an AFC Championship winning touchdown pass to T.Y. Hilton, ending the era of Manning, and beginning the era of Luck. The Titans started 2013 3-1, but a pair of three-game losing streaks in October and early December knocked Tennessee out of playoff contention, even in the AFC. Those dry spells were mostly brought on by injuries and, now healthy, the 2014 Titans show their true colors. With a great rookie season in the books, guard Chance Warmack takes the next step to an All Pro level, and fellow guard Andy Levitre also proves to be one of the game's best. The dominance of the Tennessee interior line creates enough push up front to get running back Chris Johnson going early in the season, and everyone who passed on him in their fantasy draft is kicking themselves when he surpasses 1,000 yards by week seven. With quarterback Jake Locker now healthy and experienced, the offense finds balance, and a scrappy secondary led by safeties Michael Griffin and Bernard Pollard make enough plays for the Titans to sneak in as the six-seed in the AFC. The Titans face division rival Indianapolis in the Wild Card round, and the Colts have no answer for the Tennessee line or Johnson. The Titans run it down their throat on their way to a 27-24 win. The following week, Tennessee travels to surprise No. 1 Cincinnati and continues the Bengals' playoff win drought. Pundits exclaim that Cincinnati lost the game, rather than Tennessee winning it, because the Bengals sleep walk through another dreary playoff performance. In the conference championship game, Tennessee faces it's old playoff nemesis: Baltimore. The Ravens ended Tennessee's season in the 2000 AFC Championship Game, and knocked the Titans out in the 2008 Divisional Round after they had clinched home field advantage. This time, however, the Titans are the tougher team in both trenches, and red-hot Joe Flacco is cooled off when his former teammate Pollard grabs two interceptions, including the game sealer. None of their wins are pretty, but Tennessee is headed to the Super Bowl. Vegas pegs the Titans as a 7.5 point dog to San Francisco, a line the they relish. Already feeling the heat after a first season that ended 4-12, coach Gus Bradley goes into owner Shahid Khan's office and says, "oh screw it, let's just sign the guy." The Jaguars bring in Tebow, and make several splashes in free agency, signing his old buddy Willis McGahee at running back, speedster Emmanuel Sanders at receiver, noted racist and former Florida Gator Riley Cooper also at receiver and (gulp) Mike Vick for "competition." Turns out they aren't signing Vick for competition, as Gus Bradley proves to be the gutsiest Gus since Gus Malzahn. Forget just Tebow-Mania, the Jaguars are going two-quarterbacks on all you fools. And not just any two-quarterback system, it's a hurry up system that features both QB's running the zone read, and running plays within 10 seconds of each other. Tebow takes first down, runs a zone read, then Vick sprints off the sideline and runs it again with Tebow resting… Repeat until opposing defense is sucking wind and ready to quit. Bradley messes around with Tebow and Vick in the backfield at the same time, with Tebow getting reps as an H-back and Vick moving from quarterback, to running back, to slot receiver. Needless to say, the rest of the league is baffled, as the Jaguars break every offensive record in NFL history on their way to a 16-0 regular season. The defense is still a mess, but when you average 70 points a game, you don't really notice. The Jaguars blow out the Patriots and Broncos in the playoffs, as Tebow "Tebows" right in front of a disgruntled Peyton Manning leaving the field. The Jaguars enter the Super Bowl as the largest favorite in big game history. They open as a 21 point favorite over New Orleans (a team playing in its own building). Two days after the spread opens, the line shifts nine points to Jaguars (-30). The Texans started 2013 2-0 then, well, you can tell by the record above that it all went downhill from there. But no matter, all last year did was afford a good team the ultimate reloading offseason. The Texans trade away the No.1 pick in the draft to the Browns at No.4. Not only do they swap picks with Cleveland, they also fleece the Browns into getting their 2nd, 3rd and 4th round picks for this draft. With the No.4 pick, Houston selects apex predator defensive end Jadeveon Clowney, then trades two-No.2 picks, two-No.3 picks and two-No.4 picks to jump back into the first round at No.10. Sitting there waiting is Louisville quarterback Teddy Bridgewater. The Texans defense returns to 2012 form, only far more explosive, as Clowney and All Pro end J.J. Watt form the league's best pass rush, as well as most feared run defense. On offense, the polished Bridgewater is a revelation, making few mistakes and allowing the running game to carry him early on, but eventually taking over games down the stretch, including a massive divisional win over Indianapolis in week 17. That win gave Houston the No.3 seed, setting up a rematch with the Colts the next week. It goes about the same, as Houston's pass rushers harass Andrew Luck all day, and Bridgewater throws for three touchdowns in a win. In the Divisional Round, Bridgewater leads the Texans into Foxboro, and out-duels Tom Brady, throwing for over 350 yards and four touchdowns. Brady has one last chance to lead the Patriots back, but a pair of sacks from Watt and Clowney, respectively, turns New England over on downs. The Texans head to Denver to face a Broncos team that is preparing to play its first game all year without Peyton Manning. One of Denver's new "wrinkles" in the Divisional Round against Cincinnati was Peyton running a zone read on the goal line, resulting in a touchdown, but also a torn ACL for the legendary signal caller. With Brock Osweller at quarterback, Denver is no match for the league's most feared defensive front, and Houston wins a surprising slug fest, 17-7. Bill O'Brien becomes the only coach on the Belichick coaching tree to do anything significant, and is offered the Cowboys head coaching job the week before the Super Bowl. The AFC West, also by Jeremy Conlin. They do the same exact things they did this year. The Chiefs don't have much to improve outside of, well, luck. The only thing that the Chiefs did wrong this year was happen to play in the same division as one of the best teams in recent NFL history. They went 11-2 in games against teams that didn't feature Peyton Manning or Andrew Luck (I'm not bothering to include their Week 17 throw-away game against San Diego, which they almost won anyway) and would have likely won their playoff game against Indianapolis if they didn't suffer injuries to their best offensive player (Jamaal Charles) AND their two best defensive players (Justin Houston and Brandon Flowers) while trying to salt away a 2nd-half lead. Next year they'll play a tougher schedule (New England, Seattle, San Francisco, Arizona, Pittsburgh, plus San Diego AND Denver twice), but they're still clearly the 2nd-best team in the division (and possibly the 2nd-best team in the conference outright), and Denver plays one just as hard (New England, Seattle, San Francisco, Arizona, San Diego and Kansas City twice, plus Indianapolis and Cincinnati). If Denver takes a step back and Kansas City maintains the status quo, the Chiefs could end up atop the AFC West next year, and home games at Arrowhead could give them the inside track to the Super Bowl. The Chargers made a commendable late-season push, and in doing so identified a few things about their team that could help them going forward. For example, their offense was "better" when Phil Rivers was slinging the ball all over the place, but it wouldn't really matter because their defense couldn't stop anybody. During their five-game winning streak at the end of the season, which spilled into the playoffs, they realized they're better off with a ball-control offense around Ryan Mathews and Danny Woodhead, occasionally looking for big plays downfield with Keenan Allen and Antonio Gates (and the emerging Ladarius Green). When they control the ball on offense and dominate time of possession, their near-league-worst defense wasn't as much of a factor. So what happens if they spend all their resources this offseason on improving their defense? Here's what happens - they're the Denver Broncos. Football Outsiders ranked Denver with the No. 1 offense, with a DVOA of +27.1%. In reality though, San Diego wasn't far behind - 4th at +23.7%. If they improve their defense from 32nd (where they finished in DVOA this year) to around 15th (where Denver finished), they'll make a huge leap. The schedule the AFC West plays next year (outlined above in Kansas City's section) should level the playing field in the division - all three teams (Denver, Kansas City, San Diego) could all finish 10-6 or 11-5 next year. One bounce the right way in one of those inter-division games could be what wins the division and secures a bye in Round 1. From there, it's only two games from the Super Bowl.